Posted October 25, 2010 in Jeff Potter, Puppetmaster, The Thing, Uncategorized, Wheeler Hall. 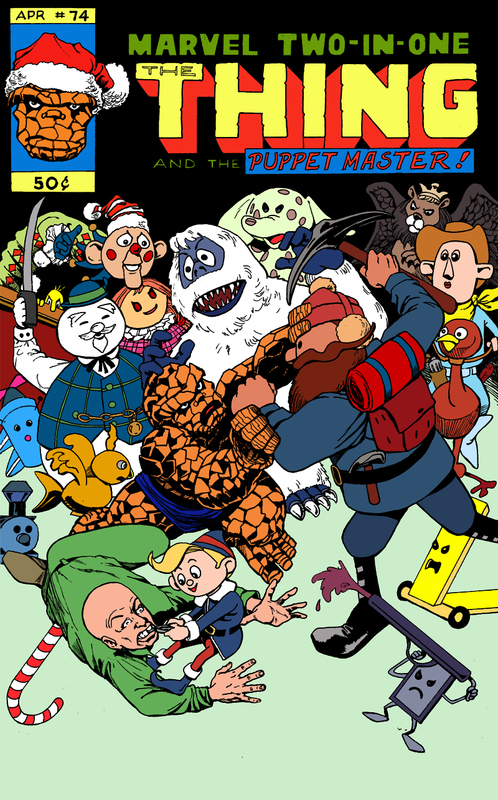 A three pronged homage here, The Thing and Puppetmaster battle the Island of Mis-fit Toys (from the Rankin/Bass production, Rudolph the Red Nosed Reindeer) in a re-creation of Frank Springer‘s cover for Marvel Two-in-One #74. Penciled and inked by Jeff Potter and colored by Wheeler Hall, it’s a perfect reminder that the holiday season is just around the corner. You can find more of Jeff’s art at his blog and check out Wheeler’s OK-Panic blog, a showcase for upcoming artists.